Emily was diagnosed with over 100 colon polyps when she was 24 years old. Genetic testing was not available to her at that time, but she got a clinical diagnosis of Familial Adenomatous Polyposis (FAP) based on the number and type of polyps (adenomatous polyps) that were removed during surgery. Emily was now 40 years old. She decided to get genetic testing because she was worried about her two children, Brandon and Katie, having Familial Adenomatous Polyposis and getting lots of colon polyps in their 20’s like she did. The genetic counselor told Emily that testing Emily would be the first step. Emily got genetic testing for a panel of genes associated with hereditary colon cancer and colon polyps. 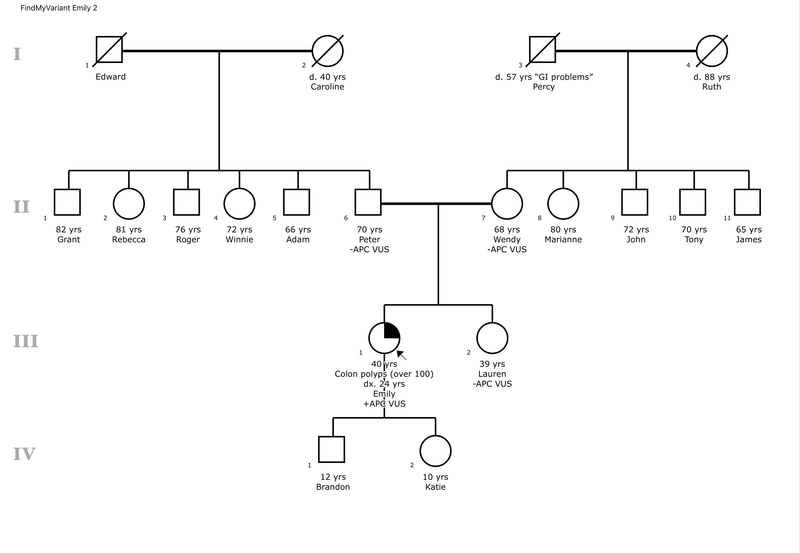 Genetic testing showed that she had a variant of uncertain significance (VUS) in the APC gene. Pathogenic, or disease-causing variants, in the APC gene can cause Familial Adenomatous Polyposis. Emily wanted to find out if this VUS in the APC gene might have caused her colon polyps when she was younger. She had a big family with lots of aunts and uncles who were living in their 70s and 80s and did not have colon polyps. If these relatives had the VUS, the VUS might be benign. After discussing this possibility with her genetic counselor, Emily decided to ask her parents, Peter and Wendy, to get tested for the VUS first. Emily’s parents had had regular colonoscopies beginning at age 50, and they had never had polyps. Neither parent had the VUS. Genetic testing also confirmed Emily’s parentage. What did this mean? It turned out Emily’s VUS was de novo. This meant that the VUS was a new change that began in Emily at some point during conception. There was also a very rare possibility that the VUS was due to germline mosaicism, meaning it was a change in her father’s sperm or mother’s eggs but not in the rest of their bodies. Emily’s sister Lauren had a rare chance (less than 1%) of also having the VUS due to germline mosaicism, so she decided to get tested for the VUS. She did not have the VUS. What did this mean for Emily’s variant? Well, since Emily’s variant was de novo and her parents definitely didn’t have the variant, and since Emily’s polyps were very specific to Familial Adenomatous Polyposis, the variant was now classified as pathogenic. This meant that it was the cause of Emily’s diagnosis of Familial Adenomatous Polyposis. Emily knew that it was still possible for her to pass the pathogenic APC variant on to her own children. Each of her children, Brandon and Katie, had a 50% chance of getting the APC variant. Emily also knew that people with Familial Adenomatous Polyposis could start getting polyps as early as age 10. If Emily’s children got tested and were found to have the variant, they could start getting screening and catch colon polyps earlier than the standard recommendation of age 50 years. If polyps were detected, they could be removed earlier, reducing the chance that the colon polyps would turn into colon cancer. Emily’s children got testing for the variant. Emily’s son Brandon had the variant, and Emily’s daughter did not. Emily shared Brandon’s genetic test result with Brandon’s pediatrician. The pediatrician helped Emily and Brandon get in touch with a pediatric gastroenterologist, who was able to make a screening plan for Brandon. This example shows that although not many family members were tested for Emily’s variant in the APC gene, Emily was still able to use important family information to reclassify her variant and help get screening for her at-risk family members.